Each week at New Story, lots of people just like you give their time to serve. Whether it’s helping kids learn about Jesus on their level, greeting first-time guests, or pitching in behind the scenes with production, every volunteer is making a difference at New Story! 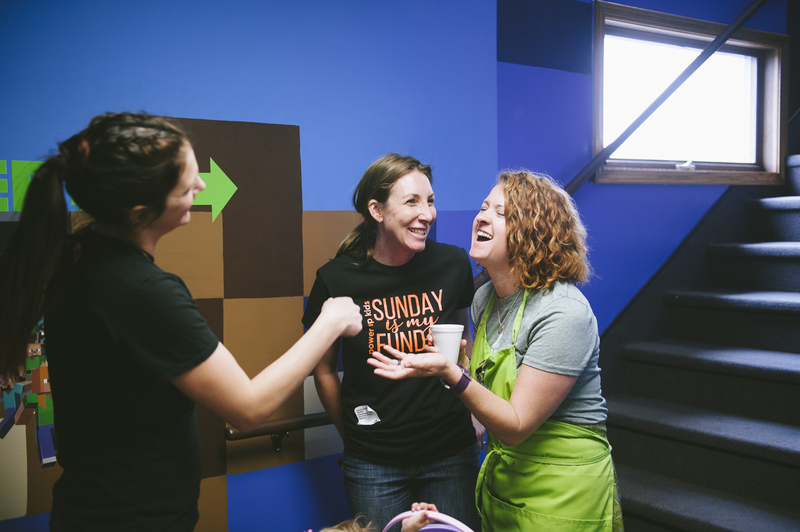 Our volunteers specialize in hospitality and help guest feel like they belong at New Story. They also work behind the scenes to make sure each environment that people experience looks the very best. Options include serving on Sundays as Hosts or during the week on our buildings and grounds team. Each environment for kids and students is designed to teach them about Jesus on their level in a safe, fun environment. You can serve with kids and students every other month, as a fill in based on your availability, or every week to provide consistency for kids that live inconsistent lives. Media and music volunteers help deliver an excellent, distraction-free service environment. If you’re creative, intuitive, hard-working, and have a passion for visual excellence and details, working with these teams may be your next step. There are spots to volunteer on Sundays or during the week behind the scenes. We believe that everyone has a story, and every story matters. This is why we offer spiritual and physical assistance through our prayer teams and food pantry. If you want to make a big difference in someone’s life behind the scenes by being part of their next step, we’d love for you to join us! We offer shadowing positions for anyone who is interested in trying out a spot before they commit. We don’t want to fill a ministry position just to have another volunteer; instead, we want you to be fulfilled and blessed by being a part of making more and better disciples! We would love to sit down with you and personally discuss which of these options fits best with your availability, passions, and personality. Some people know right away how they want to serve, but other people want to explore all of their options before they decide. We let you shadow in as many areas as you want before you decide which team is best for you!